Credits: (CC by 2.0) by Carreño AM, et al. Anais Brasileiros de Dermatologia. 2013. Longitudinal melanonychia, otherwise known as a black nail streak, may be quite intimidating, as it raises fear about nail cancer. There are certain features that clinicians look for when assessing the possibility of malignancy, like melanoma of the nail. Here are some underlying conditions and external factors that may cause benign dark streaks to appear on or in the nail. 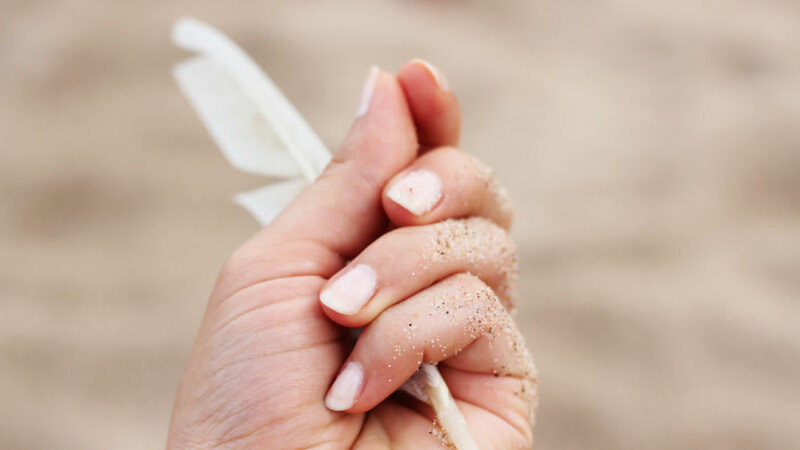 In a normal, healthy nail, the cells that produce skin pigment (known as melanocytes) are not overly activated, which is why nails are clear and natural colored in appearance. The brown to black color that may show on the nail in the form of a streak is due to either activation of melanocytes or dividing melanocytic cells, and there are many non-malignant reasons for these processes to occur. Here are a few factors that can affect if you will have a black streak on your nail. Studies have shown that people with ethnically darker skin have a higher chance of developing a benign dark streak on the nail. One study conducted with a population of African Americans concluded that close to 90% of these patients will have a benign nail streak before the age of 50. 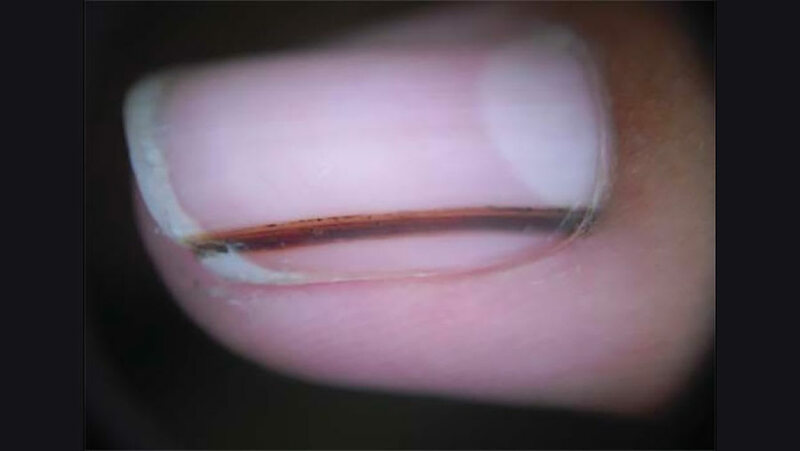 Nails streaks seen in darker pigmented individuals are more common on the thumb, index finger, and middle finger. A study in 57 Mexican patients determined that nearly 74% of the black streaks were benign and due to ethnic factors, 20% were due to injury or infection, and only 6% were due to a skin cancer. The least common cause of a black streak was nail melanoma. However, it is not to say that a black streak on someone of ethnic descent should not be concerning, as many other factors, such as family history of melanoma and age may be important. Any new black streak should be evaluated by a dermatologist. There are many biological changes that take place in a woman’s body during pregnancy. Skin darkening (known as hyperpigmentation) is common in pregnancy and benign in nature. Some of the areas affected by hyperpigmentation include the face, which is known as melasma, the abdomen, known as the linea nigra, and the nail bed. Why does this happen? Estrogen, progesterone, and melanocyte-stimulating hormone are all increased during pregnancy and cause darker pigmentation to form in select areas of the body. Repeated trauma or injury to the nail can lead to permanent damages. Poorly fitted shoes, lacerations, and any physical injury to the nail can cause a black nail streak[7,8]. A series of chemotherapeutic agents, antibiotics, and steroids are associated with longitudinal melanonychia. A nevus, more commonly known as a mole, of the nail unit is seen more commonly in children and young adults. 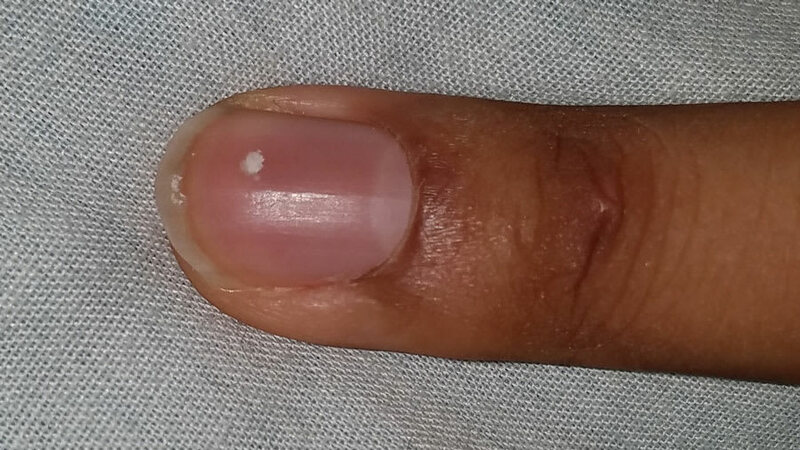 In some cases, a fungus can infect the nail and lead to black pigmentation along the nail bed. [9,10] There are over 21 types of fungus that can cause black pigmentation once they infect the nail. One way to check if a dark streak on the nail has a higher chance of being a nail melanoma skin cancer is to review the ABCDEF’s of nail melanoma. Family history: any family members with a history of melanoma or moles. The ABCDEF’s of melanoma were created to help people understand when a black nail streak is more concerning for a nail melanoma. The idea of the mnemonic is that the more letters that are positive, the more important that the nail is evaluated by a dermatologist. An additional finding that increases the risk for melanoma is named Hutchinson’s sign and this is when the nail discoloration extends onto the skin behind the nail. Ultimately a biopsy is the only true diagnostic tool that will confirm a nail melanoma. However, nail melanoma is often misdiagnosed or diagnosed late, which can lead to a poor prognosis for the patient. One study noted that 50% of patients die before 5 years of a nail melanoma diagnosis and it is due to late diagnosis, which limits treatment options. The ABCDEF’s of nail melanoma can decrease mortality by creating awareness of nail changes and seeking early treatment if needed. It is important to know that there is a possibility that a benign presentation may be masking a malignancy; therefore it is important to be aware of any changes over time. If you’re not sure about what it may or may not be, make sure to always seek medical care with a dermatologist. You can read more about what features to look for if melanoma of the nail is suspected. Haenssle HA, Blum A, Hofmann-Wellenhof R, et al. When all you have is a dermatoscope- start looking at the nails. Dermatol Pract Concept.2014;4(4):11-20; PMID: 25396079 Link to Research. Ip KH-K. Melanonychia. 2014; https://www.dermnetnz.org/topics/melanonychia/. Accessed November 18, 2017. Dermatology atlas for skin of color. New York: Springer; 2014. Dominguez-Cherit J, Roldan-Marin R, Pichardo-Velazquez P, et al. Melanonychia, melanocytic hyperplasia, and nail melanoma in a Hispanic population. J Am Acad Dermatol.2008;59(5):785-791; PMID: 18804895 Link to Research. Hassan I, Bashir S, Taing S. A clinical study of the skin changes in pregnancy in kashmir valley of north India: a hospital based study. Indian J Dermatol.2015;60(1):28-32; PMID: 25657393 Link to Research. Massinde A, Ntubika S, Magoma M. Extensive hyperpigmentation during pregnancy: a case report. J Med Case Rep.2011;5:464; PMID: 21929778 Link to Research. Mendiratta V, Jain A. Nail dyschromias. Indian J Dermatol Venereol Leprol.2011;77(6):652-658; PMID: 22016271 Link to Research. Jefferson J, Rich P. Melanonychia. Dermatol Res Pract.2012;2012:952186; PMID: 22792094 Link to Research. Finch J, Arenas R, Baran R. Fungal melanonychia. J Am Acad Dermatol.2012;66(5):830-841; PMID: 22257832 Link to Research. Saunte DM, Tarazooie B, Arendrup MC, et al. Black yeast-like fungi in skin and nail: it probably matters. Mycoses.2012;55(2):161-167; PMID: 21736629 Link to Research. Levit EK, Kagen MH, Scher RK, et al. The ABC rule for clinical detection of subungual melanoma. J Am Acad Dermatol.2000;42(2 Pt 1):269-274; PMID: 10642684 Link to Research. Carreno AM, Nakajima SR, Pennini SN, et al. Nail apparatus melanoma: a diagnostic opportunity. An Bras Dermatol.2013;88(2):268-271; PMID: 23739714 Link to Research.